on behalf of some ideas that we have the best of our life and which do not hesitate to give what it is we, fellow of the factories, land, from the trenches, you have to back to our starting point! There is no reason to deny our past or to hide our identity. We are proud to mean a way of salvation for Spain and the world. Comrades, anyone who tells you that we have to change jackets, that we have to take new positions, that we have to corner as museum junk our ideas and our traditional methods, is an enemy of war, is an enemy of the revolution and is an enemy of Spain. Long before the revolutionary movement in July 1936, we denounced the longing felt by some comrades to move the center of gravitation, the historical basis of our concerns into land apparently more suggestive, more attractive,less thorny, but also more sterile and ineffective. The circumstances experienced in these last two years have been towing the elemental force of raging torrent. We have been led by events rather than by their managers and leaders. Blame? We all put our hands on it, some actively and others passively, some doing and others having not. But what has been imposed by force, which we thought not advisable to oppose then resistance can not become final tactic,in principle permanent orientation. We are what we are because we had a firm and solid base of activity: the workplace, the world of workers with their pain and misery, and because we have made there, among the din of the machines or the rough breaks agricultural work, a new conception of life, the vision of a new future for modern slaves. 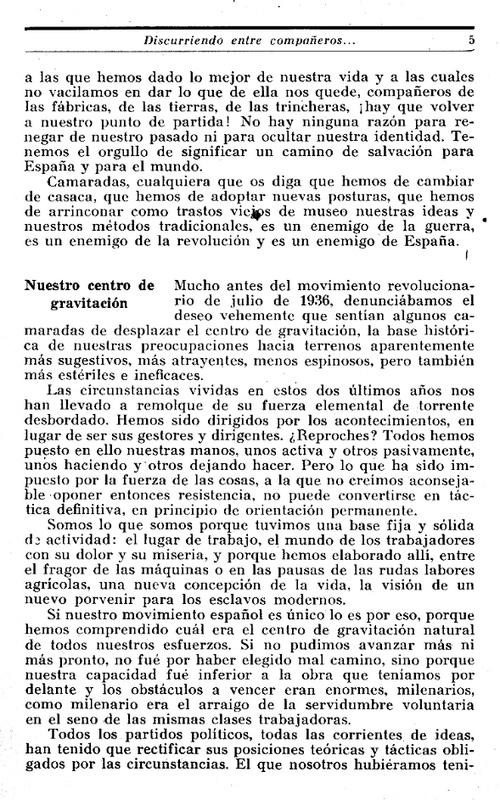 If our spanish movement is the only one it is because of so, we understood what was the natural gravitation center of all our efforts. If we could not advance more and sooner, it was not for having chosen evil way, but because our capacity was less than the work that lay ahead and the obstacles overcome were enormous, ancient, as was the ancient roots of voluntary servitude within the working classes themselves.